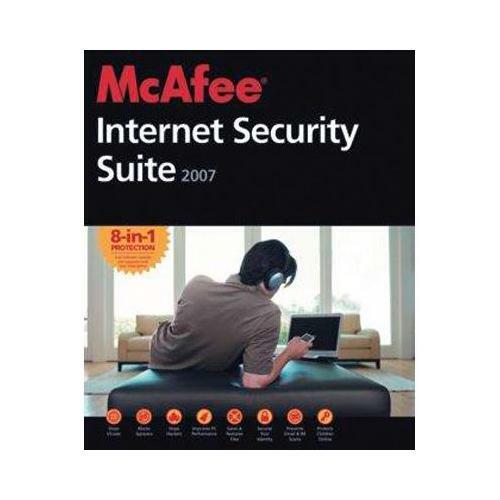 McAfee® Internet Security Suite with SiteAdvisor lets you enjoy a worry-free Internet experience by protecting your identity and computer from viruses, spyware, e-mail scams, hackers and online predators plus it provides automated backup for important files. McAfee’s trusted protection is always on, always updating and always protecting you while you surf the Web, shop, bank, e-mail, instant message and download files. McAfee also makes it easy to view your security status, scan for viruses and spyware and ensure your products are up-to-date using the redesigned McAfee® SecurityCenter. Plus, receive the latest McAfee software and updates with your paid subscription automatically so you never have to reinstall a new version manually. Stops Viruses. Automatically blocks, cleans and removes viruses so you can surf the Web safely and download files. Backs Up and Restores Files. Automated backup and one-click restore so you don't lose photos, music and important files. Secures your Identity. Protects your online identity so you can shop, bank, e-mail and instant message worry-free. Prevents Spam and E-mail Scams. Prevents spam and phishing scams so you can e-mail with friends and family safely. Protects Children Online. Filters offensive content, pictures and Web sites so you can keep your children safe when they are online. Automatically monitors incoming and outgoing Internet activity, looking for suspicious applications and data. Guards important files stored on your computer and helps prevent your computer from crashing. Provides advance warning to help you avoid sites which send spam, install adware or attempt online scams. Redesigned for you. Scan your computer, check for updates and configure your security settings using the new McAfee® SecurityCenter. This essential, easy-to-use program gives you one-click access to your computer’s security information. Always On, Always Protecting. 24/7 virus and threat protection from McAfee® AVERT® Labs continuously monitors worldwide virus activities and provides immediate anti-virus protection and removal solutions. Always Upgrading, Always Updating. Daily updates are installed automatically. When a new version of McAfee is available, you get it automatically at no charge during your subscription, ensuring that you always have up-to-date protection. Convenient, Ongoing Protection. McAfee offers a variety of renewal options to keep your McAfee protection current. Real People, Real Help. Support from McAfee’s computer security experts, via Internet chat, e-mail and phone (www.mcafeehelp.com). New! Integrated anti-virus, anti-spyware, firewall, anti-spam, anti-phishing and backup technologies work together to combat today’s sophisticated, multi-pronged attacks. Improved! Spyware protection detects, blocks and removes spyware and adware. New! Automated backup saves copies of your most valuable files wherever you want, encrypting and storing your files on a CD/DVD, USB or external or network drive. New! McAfee® ImageAnalysis enhances content protection by protecting your family from potentially offensive content and pictures. New! McAfee® SystemGuards watches your computer for specific behaviors that may signal virus, spyware or hacker activity. New! McAfee® X-Ray for Windows detects and kills rootkits and other malicious applications that hide from Windows and other anti-virus programs. New! McAfee® SiteAdvisor™ adds safety ratings to sites and search engine results based on comprehensive spam, adware and online scam safety tests. Improved! McAfee® SecurityCenter makes it simple to review your computer’s security status, check for updates and fix potential security issues. New! Network® Manager monitors PCs across your network for security weaknesses so you can easily fix security issues from one centralized network map. New! Built-in computer health and performance tools keep your computer running at peak performance.